I sing of golden-throned Hera whom Rhea bore. Queen of the immortals is she, surpassing all in beauty: she is the sister and the wife of loud-thundering Zeus, the glorious one whom all the blessed throughout high Olympus reverence and honor even as Zeus who delights in thunder. Hera was one of the 12 Olympian Gods of Classical Mythology. 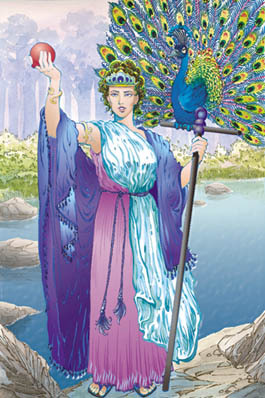 Hera was the youngest daughter of the youngest daughter of Gaia and inherited her garden. 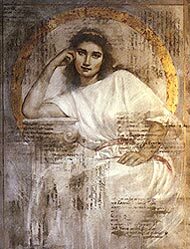 She was the third daughter of Rhea and Cronos, called the "gold-shod Hera". Like her brothers and sisters (all but Zeus and possibly Poseidon) she was swallowed by her father as she left her mother's womb, and regurgitated later when Rhea got tired of having her children swallowed. After her regurgitation Hera was tended to by the three Naiades Euryboea, Prosymna, and Acraea. 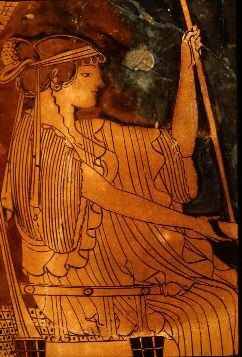 At the Heraeum (an important temple of Hera's) the environs of the sanctuary is called Euryboea, the land beneath the Heraeum Prosymna, and the hill opposite the temple is named Acraea after the three nurses' attendence on the Goddess. Another story says that a man named Temenus raised Hera, and that he gave her three names. As a maiden, before she married Zeus, he called her Girl (Kore). When she married Zeus, he called her Adult (this being her most known and understood form). When she and Zeus fought, and she returned to stay in Stymphalus with Temenus, he called her Widow. The relevance here is that, from a patriarchal perspective, those are the important phases of life of a woman, and Hera is a crucial representation of the gender. Keep that in mind as you read on. Hera was most known for her marriage to Zeus, and from her marriage with him were born three children: Hebe (the Goddess of Youth), Eileithyia (the Goddess of Childbirth), and Ares (the God of War). During their marriage she got angry at Zeus for his apparent parthenogenic bearing of Athena and responded by bearing Hephaestus without the help of a man. She was his third wife, and made no effort to persecute any of the wives or children of previous marriages of Zeus. But woe to the maiden or child formed of an adulterous union, for Hera was the jealous protectress of marriage, and was not easily placated once she felt her territory threatened. Ironically, there's nothing said about an actual wedding, rather the story goes that Zeus turned himself into a cuckoo (which is a notoriously randy bird in Ancient Greece), and when she put the little bird to her breast, took advantage. But she was the perfect patriarchal image of what marriage was: a shrew. She wasn't very nice, not to anyone, including her children, and she destroyed anyone who Zeus even looked at sideways (of course, she was usually right in assuming that he was sleeping with them). She also went after the children of Zeus' ilicit affairs, most famously, Heracles. The result of this was the Twelve Labors, probably one of the most famous of all myths. She was ridiculously vain, as well as jealous, and jumped in a spring at Canathus once a year to renew her youthful appearance. But despite her somewhat unattractive personality, heroes like Jason still revered her above all others, and Heracles built temples to her everywhere. Ixion lusted after her, and ended up fathering the Centaurs with a cloud imitation of the goddess, and Endymion, Selene's lover, was apparently put into his eternal sleep for lusting after Hera. She was the patron goddess of Argos (Poseidon was bitter about that), and had temples all over Greece. No bones are made of the fact that Hera was all about power. In the myth of the Golden Apple (also known as the Judgement of Paris), all started by her dramatic daughter Eris, her bid to the young hero was all the power he could imagine. She probably couldn't imagine why he ended up picking Aphrodite, but she took it out on the Trojans during the war that ensued as a direct result of Paris' decision. She may have been Queen of the Gods, but she was still a second class citizen in patriarchal ancient Greece. Ultimately, when push came to shove (literally - Zeus actually threatened her with thunderbolts to keep her under control), she was never "the Decider." Hera deserves your attention because she most depressingly and accurately represents what must have been the reality for so many ancient Greek women (particularly the upper class ones). Long ignored by feminists and proud women, Hera represents what real agency looked like, and her fight for power over her own domain is one that deserves respect. As she was worshipped in many different places, she had many different epithets (names). The following is a list of Hera's epithets that I jacked from my Robert Bell's Women of Classical Mythology: A Biographical Dictionary (and if you are interested enough to actually read this list, you should really think about investing in his book -I highly recommend it): Acraea, Aegophagus, Ammonia, Antheia, Argeia, Bunaea, Chera, Gamelia, Henioche, Hippia, Hypercheiria, Imbrasia, Pais, Parthenia, Pelasga, Pharygaea, Prodromia, Samia, Telchinia, Zygia.